Softcover, 7 in. x 10 in. The variety of cars, colors and the sense of "history come to life" makes vintage racing one of the most thrilling and popular forms of motorsport competition. As Stirling Moss observed, "It has to be a very blasé person who doesn't feel their adrenalin rising when the starter's flag falls." 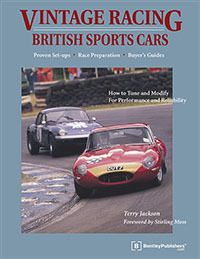 Author Terry Jackson has interviewed racers, tuners, and race organizers and created the most comprehensive, authoritative guide to vintage racing. Vintage Racing British Sports Cars takes you marque-by-marque through the exciting-and still relatively affordable-world of British sports cars. It tells you how to select and buy the right car, how to prepare it for the track, and how to get started if you've never raced before. This book offers race-proven preparation tips and modifications for each specific model: how to get more horsepower, better cornering performance, and increased reliability. These are actual setups that the best racers are running. With 225 photographs, including fascinating historical shots of the cars in competition, this is the essential book for all vintage racers and British car enthusiasts. The author has done much research, picked the brains of hundreds of people, and gleaned an enormous amount of hard-earned expertise. I thought I had quite a few answers, but I must admit that it taught me quite a bit! This is a book you can learn from and enjoy. 3-6. Oulton Park, 1957. 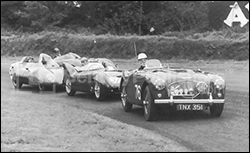 Austin-Healey 100-4 is chased by two Lotus Mark 9s, and one Lotus 11. 5-4. Jaguar Mark II was a popular racer in England and Europe from the beginning. 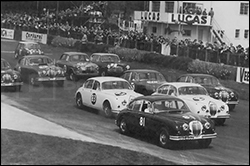 This saloon car race in England is circa 1962. 13-6. 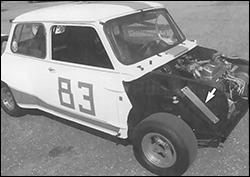 This Mini is a former SCCA racer, modified with fully-removable clip-on hood and fender flares. Note location of oil cooler in wheel well. 15-6. 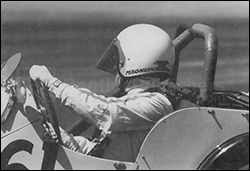 This Morgan Driver is well prepared for the turn: hands positioned correctly on wheel, and looking ahead past the turn to see where he wants to go next.